Pupils from Brampton Primary School have helped bring a touch of colour to the town's coach station. The students helped put the final touches to the Pocket Park project on Markham Road, at the entrance to the coach station by planting 3,000 purple, yellow and white crocus corms. 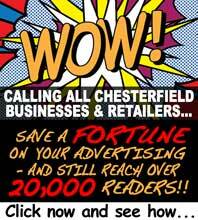 The project, which started last year, is a collaboration between Chesterfield Civic Society, Franke Sissons and Chesterfield Borough Council, with support from Destination Chesterfield and Killingley Landscapes. It aims to provide a welcoming green space for those who travel by coach and for shoppers passing by. 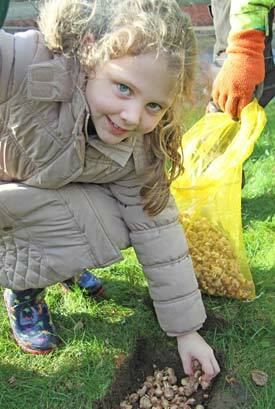 Brampton Primary School pupil Isabelle Hodgson (pictured), plants some of the bulbs at Pocket Park near the coach station. Chesterfield Civic Society suggested the planting scheme and paid for the bulbs. Chesterfield Borough Council staff provided spades for the project and helped with digging and preparing the ground for the bulbs to be planted by the children. Amanda Chalke, Civic Society executive member, said: "We are delighted to work with Brampton Primary School and Chesterfield Borough Council. It now means the project has involved primary and secondary pupils and a talented young designer who attended Chesterfield College. "Projects such as this are statements of pride in our town by all age groups. We hope to see more." Councillor Chris Ludlow, Chesterfield Borough Council's cabinet member for health and wellbeing, said: "This individual project is part of the wider Chesterfield in Bloom project work, which aims to involve the community in making our town a greener and brighter space. "The work of the children and all the partners will help improve the welcome that coach visitors to the town get, as well as benefit residents."